This tool helps students identify direct evidence, pulled from the text, to answer specific questions. 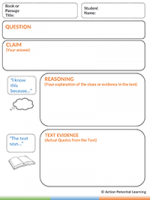 The graphic organizer helps students organize and clarify their reasoning and directs them to locate specific evidence to form arguments supporting their claims. Also, this tool helps build the skill-set of identifying the most relevant quotes when forming an argument. 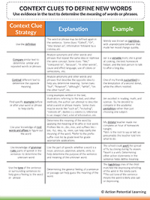 These reading comprehension strategies are essential to forming well-researched arguments when preparing essays or answering passage questions on exams. This reading strategy tool helps students track the sequence of events taking place while reading. 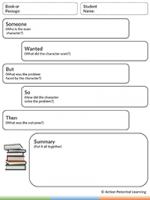 By completing the sections of this graphic organizer while reading passages, students will learn how to instinctually follow the order of events taking place in specific stories, a critical factor for reading comprehension. 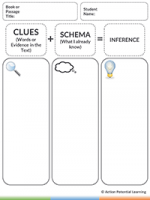 A key component of reading comprehension; inferences, are conclusions that are drawn by combining clues in the text and schema (what you already know). This is a concept that is often taken for granted by experienced readers, but is a critical reading strategy deficiency for students struggling with reading comprehension. This tool helps students practice identifying, understanding and finally drawing inferences as they practice reading books or passages. 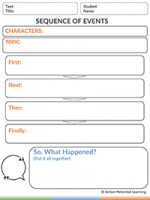 The purpose of this tool is to help students organize their thoughts when summarizing events and story lines concerning a specific character “someone”. 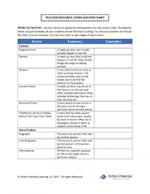 This reading comprehension tool helps students practice explaining concepts such as character transitions, struggles or basic story lines in essays or while answering questions about specific passages. 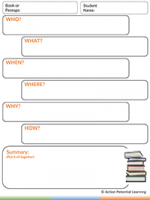 Use this graphic organizer tool to help guide students on preparing short summaries of a passage or story. This tool helps students focus on the key elements that need to be addressed when writing a summary for an exam or as part of an essay, and is also a critical skill needed for reading comprehension. Use this tool to teach students how to use context clues to identify the meaning of unfamiliar words. This reading strategies tool gives students 7 different word identification methods to use when taking an exam or reading passages. 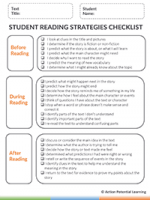 Use this checklist to identify key activities students should be engaged in while reading passages and stories to maximize reading comprehension. The action items are categorized as key activities to be completed, before reading, during reading and after reading the passage.